The killer Bs? 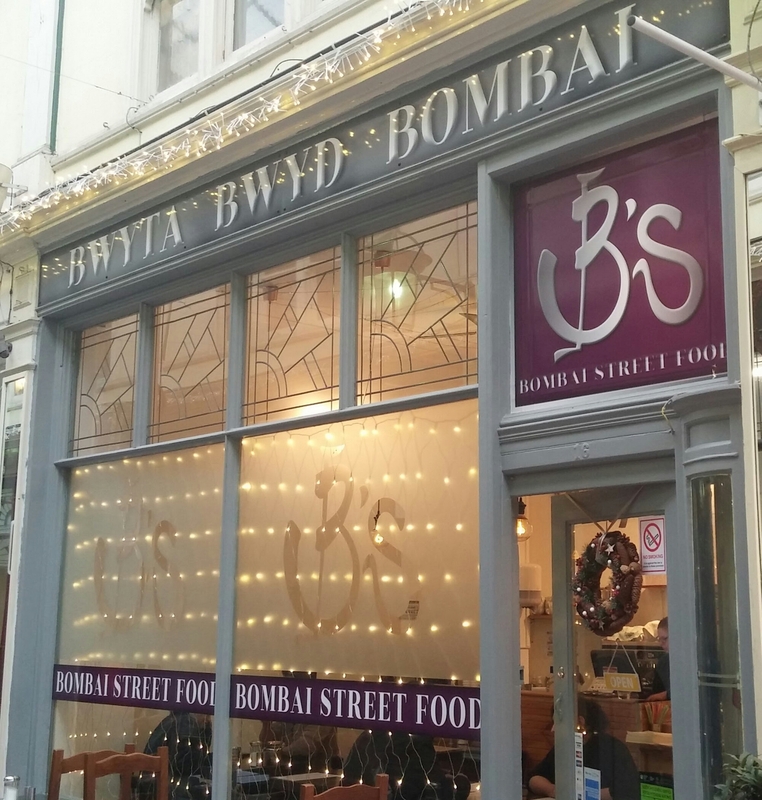 Bwyta Bwyd Bombai, High Street, Arcade, Cardiff. After a period of de-currification of the Cardiff City centre (with the only really decent one in the Centre in the form of Spiceberry having closed some time ago – don’t really rate, am afraid, the standard fare curry houses in town that are the Juberaj, Spice Quarter and the Mango House and whilst it has its place in the hearts of many I don’t count a Caroline Street chicken curry), there seems to have been a somewhat welcome change of tack with Indian street food coming to town. 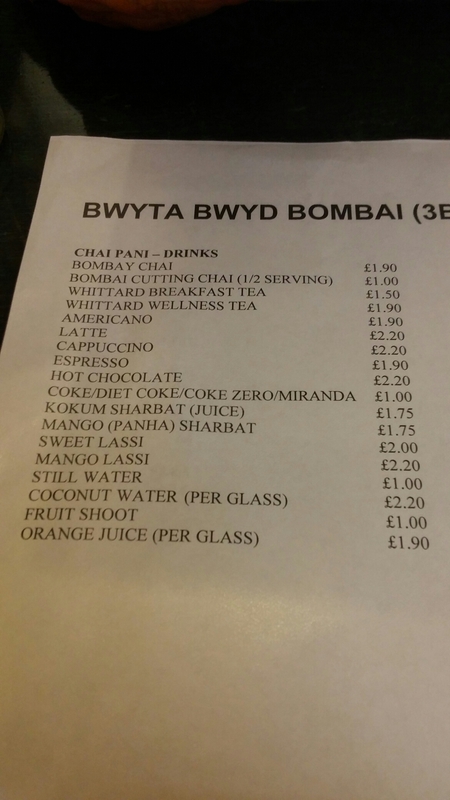 We now have Gina’s (which I very much like), and more recently Chai Street (who have opened up a second branch in the centre city – review in progress – see my review also of their Canton branch) and Bwyta Bwyd Bombai. Whilst curry is not perhaps seen in the UK as usual lunch time fare, the likes of the bhaji, dhosa, puri and pav make for lovely alternatives to a sarnie. Easy to eat in and (for the most part) to take out. Sarnie diehards are also catered for here, with things like wraps and toasties all of which are given a Mumbai twist. In Mumbai (Bombay) these sort of lunches are delivered to places of work by dabbawallas (at a rate of 200,000 + a day with accuracy in terms of getting what you ordered delivered to you so astonishingly good that apparently on average they get one wrong/miss a delivery once in every 2 months – which equates to an accuracy rate of in excess of 99.9999999% – bet some miserable fxxkers complain on Tripeadviser about that mind!!!!!!!!) or picked up from the myriad of Mumbai street food vendors. 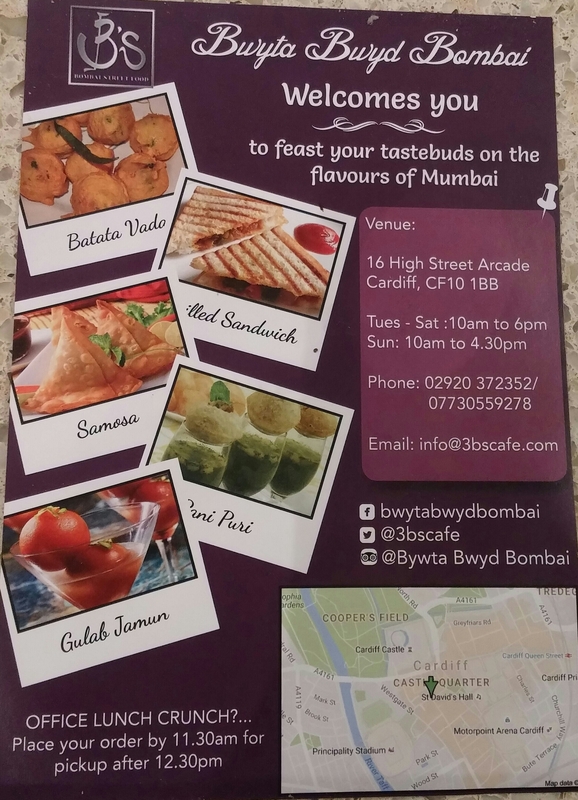 Bwyta Bwyd Bombai (3B’s) takes its cue from Mumbai street food and what keeps a city of 20 million plus on the move must be pretty good I thought. Initial reports I had heard were all good so I decided to give it a go one Sunday lunch time after shoe shopping with Mrs. SF. Shoe shopping is only marginally better than my definition of hell – which is wandering aimlessly around a garden centre (if, when I slip this mortal coil, I go downwards rather than ascending upwards or merely slowly rotting I fear that may be my fate for eternity – must be good, must be good!! 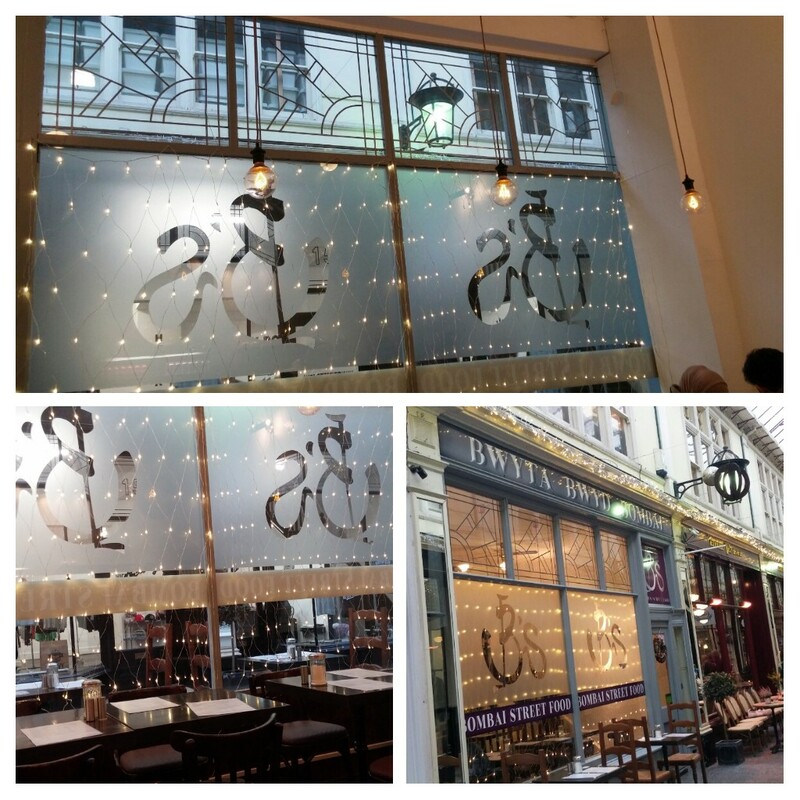 ), so I was very happy to make it to this place for a late lunch. Inside it is fairly compact with only about 6 odd fairly closely packed tables. The kitchen is upstairs so not sure if more space up there, in addition to tables outside on High Street Arcade. It is a nice enough space, if a bit cramped downstairs. 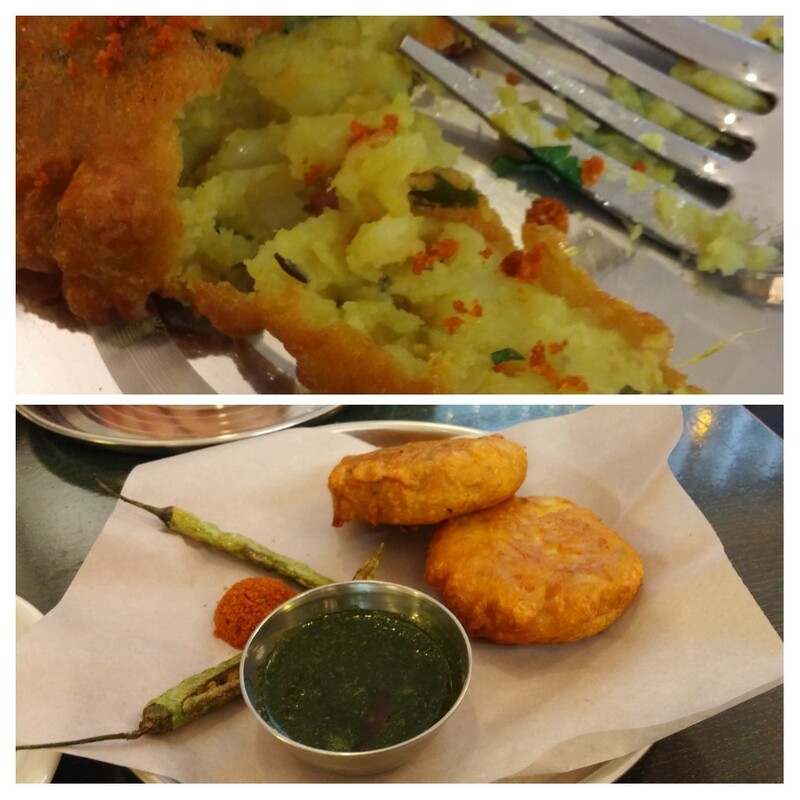 We went for a mix of the two, being quite hungry, and started off proceedings with B1 – the batata vada plate (£3). Nicely spiced deep fried potato cakes, this was comfort food with the added oomph of some decent spicing. They had a crisp oil free exterior and a soft lump free interior.The spicing in the patties themselves, in the accompanying chutney (a mix of mint and coriander) and the mysterious pile of red powder (chilli and a few other toasted spices) on the plate was very pleasant and lifted what could have been a quite dull dish. Further heat, if needed, was provided by fried chilli peppers on the plate. To a chilli wuss like me they were quite fiery – to Mrs. SF they were nay bother. 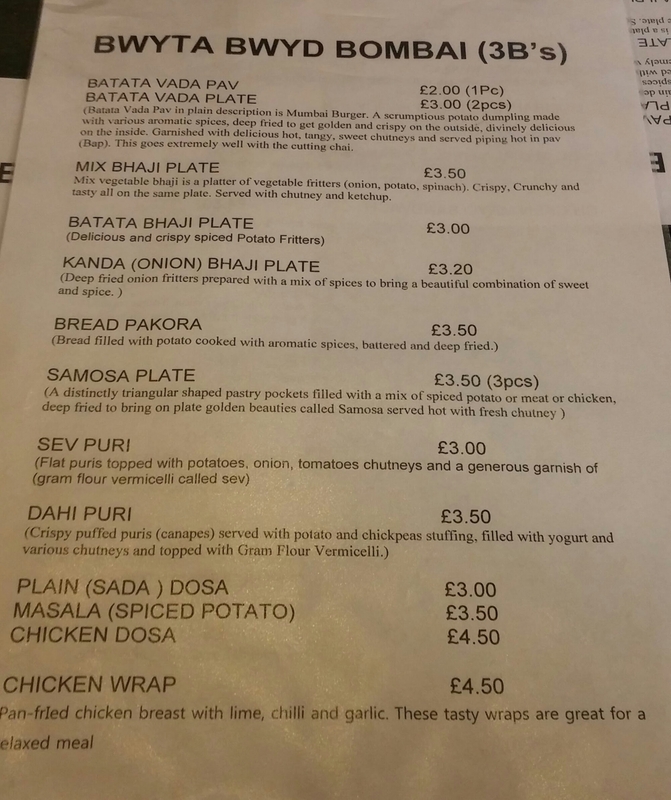 Next up was B2, a very generous mixed bhaji plate (£3.50). 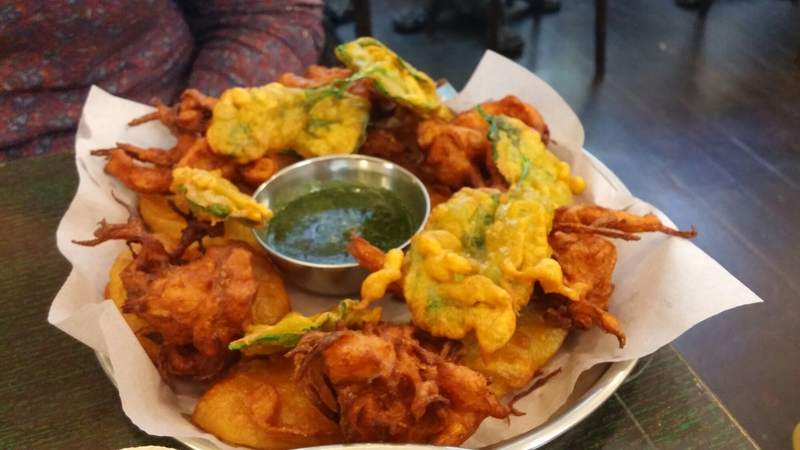 Nicely battered spiced potato slices, onion and baby leaf spinach (with the latter in a lighter – more tempura like – batter) had a good flavour to them and were complimented well by the same mint and coriander chutney that came with the batata vada. 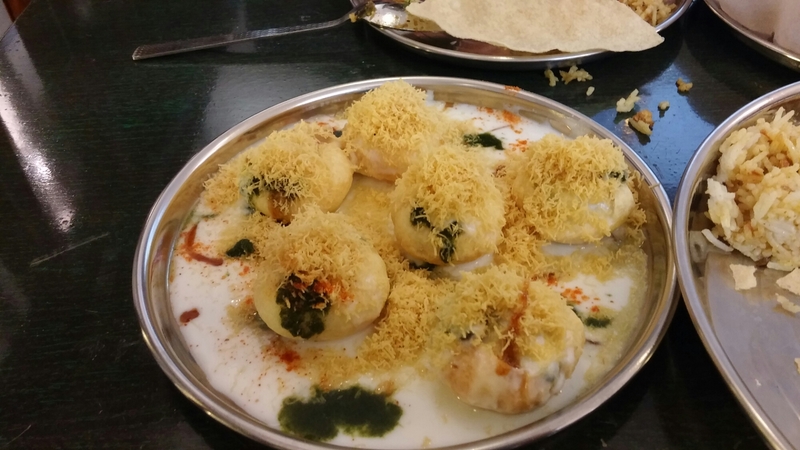 We moved on to some rather lovely dahi puri (£3.50). Pop them into the gob and they become literally melt in the mouth stuff, releasing their spiced yogurt filling. A satisfying crunch was provided by way of a topping of gram flour vermicelli. All very moreish. Last of the 3Bs was a chicken biryani (£7.50), which was sadly the only slight dud of the meal. 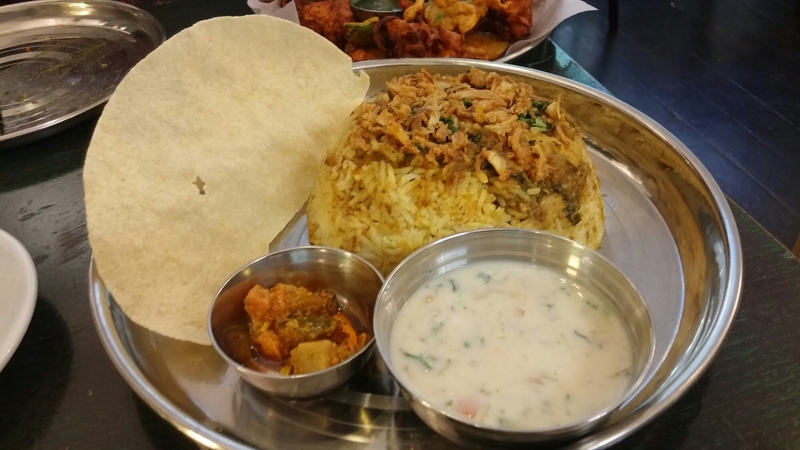 To my mind, it was more akin to a pulao (pilaf type arrangement) than a biryani. It was also a bit tepid on both the heat and the spicing fronts and the chicken was a touch on the dry side. In short, it was just a bit bland. The redeeming features were an excellent raita and an outstanding lime pickle (nice heat and packed full of flavour). 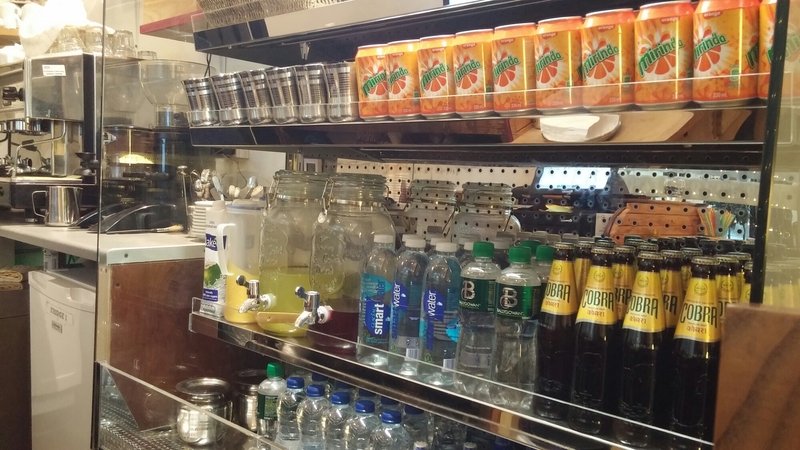 They have a selection of cold and hot Indian (and more Western) drinks to choose from. Decent pricing, with sodas a very reasonable £1. 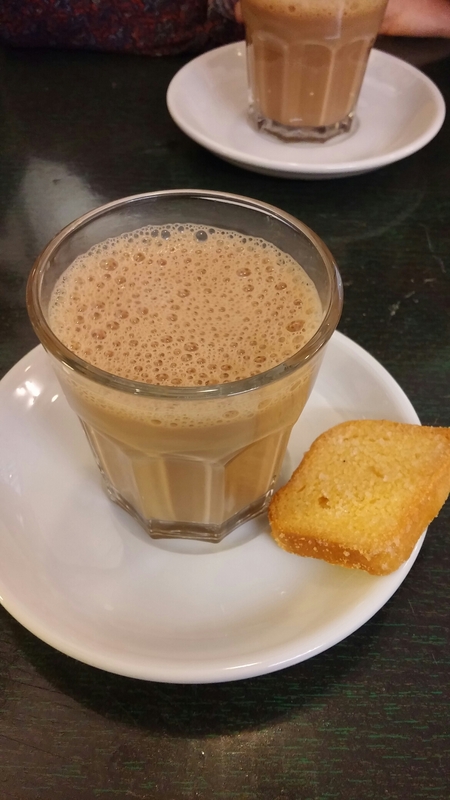 After our chais, we decided to give some of the cold drinks a go and I was particularly intrigued by the sharbats. I asked what they were like and was offered a “try before you buy” taste of both the panha (raw mango) and kokum (a plant from the mangosteen family) sharbats on offer. The later was a bit medicinal for my tastes so I went for the panha one. This was a slightly odd mix of not quite sweet, not quite sour and not quite salty. An acquired taste for some I suspect (best to try before you buy like I did), but I actually quite liked it. 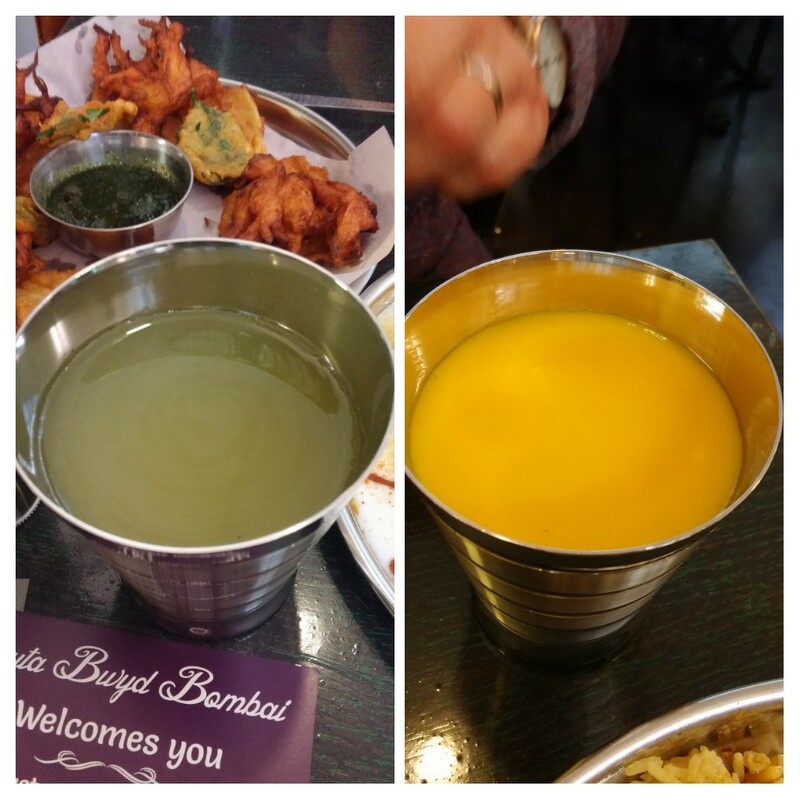 Mrs.SF’s mango lassi was an exemplary example (thick and really fruity) of what is one of my favourite soft drink. With perhaps the exception of the slightly disappointing biryani, I was very impressed with the food and drink offering here and would certainly grade it with a solid 3 ‘B’s as per its name. A better biryani and it would have got ‘A’s. Would I go back? Definitely, place offers something deliciously different for lunch at very tempting prices . 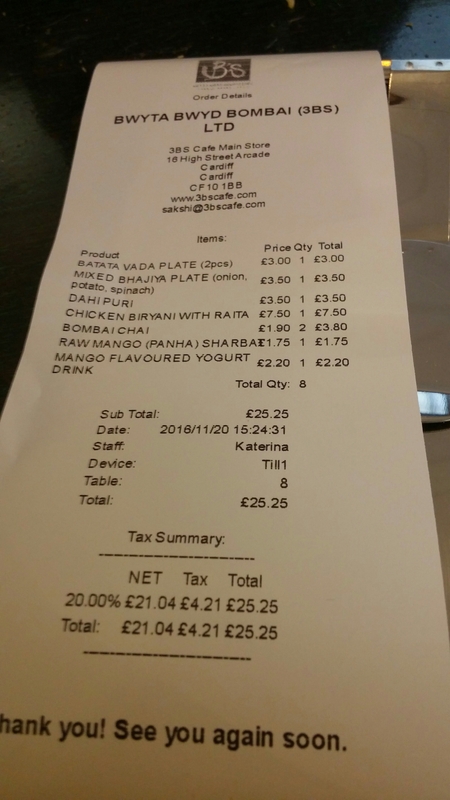 I thought the price (sans a well deserved tip – service was very good) we paid very good value and I am keen to explore other aspects of Mumbai street food they have on offer. These are all on the flyer pictured below. 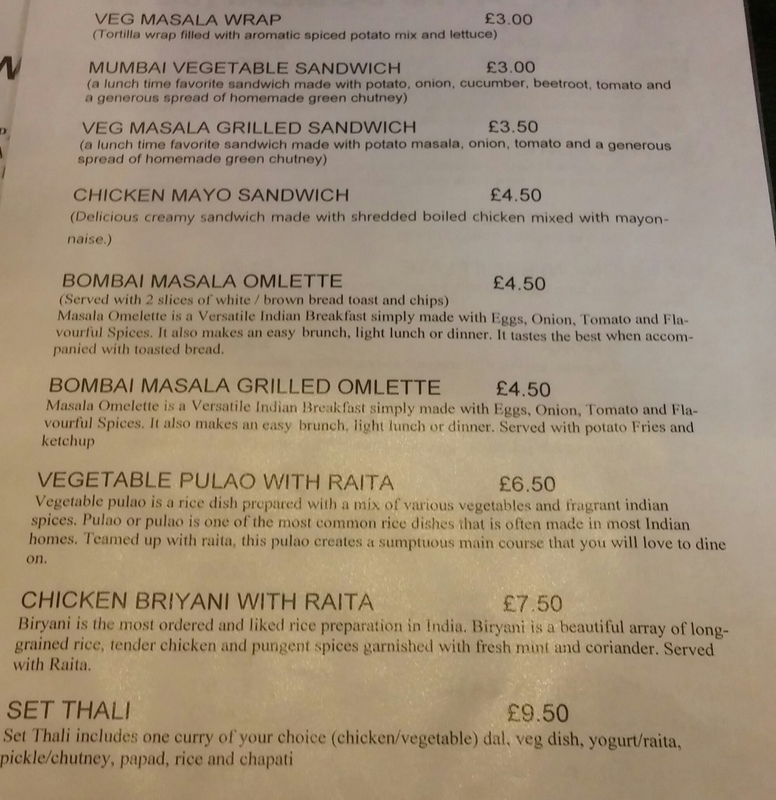 This entry was posted on Nov 27, 2016 by solicitingflavours in Alcoholic drink, Breakfast, Bwyta Bwyd Bombai, Cafe, Curry, desserts, Drink, Fast food, Food, Indian, lunch, lunchtime, Mumbai, New restaurant Cardiff, Non alcoholic drink, Restaurant Review, review, Sandwich, Street food, Takeaway, Tea, vegetarian food, Wales.